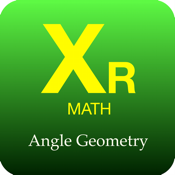 Every XrMath App provides a virtually limitless supply of questions to let students DO math. Intended for classroom use but also suitable for individual work. Questions can be repeated as often as needed - the numbers are random. The list of questions is color coded to show the degree of difficulty. The question difficulties range over several grades. Those students that need to can start with easier questions. Those who finish quickly can move on to more challenging ones. The teacher and student chose where to work. They can go back or skip forward, at any time, to get questions that are appropriate. There are tutorial screens - intended for revision. Every question has a Example screen showing a worked example, but with different numbers. Where possible, responses to incorrect answers are helpful. The question selection list is updated to show how many times each question has been correct answered, so both teacher and student can monitor progress. The App generates the question and marks the answer, leaving the teacher free to work one-to-one with individuals or groups of students.